Check out what came in the mail today!! 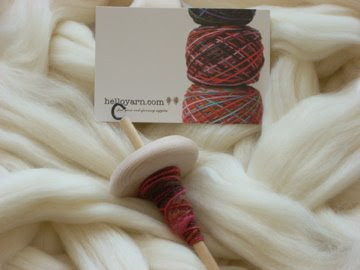 Yep, a drop spindle and a pound of roving from HelloYarn. I went with the undyed wool because I figured I wasn't going to get anything useable out of this batch anyway, so it wouldn't matter what color it is. If it turns out that I do get some yarn that I want to use, well, I have always wanted to try Kool-Aid dying! Below is what I managed to spin up on my first go. 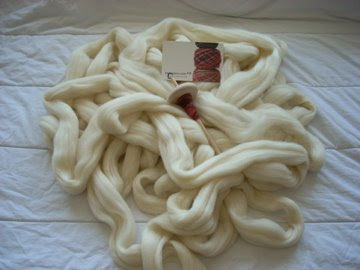 You may notice that it is not undyed like the rest of the wool. 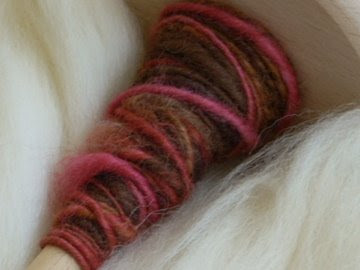 This little bit was some pre-drafted yarn that HelloYarn included in the package to practice spinning with to get the feel of what the roving should be like when spinning it up. I'm not sure it worked. As soon as I added some fiber that I drafted myself the yarn went from being somewhat worsted to a bulky weight and, well, it's not pretty. Isn't it beautiful?! (Read: ugly). Surprise - spinning yarn is harder than it looks.